Walking along an unsurpassed assembly of towering obelisks, endless courts and splendid chapels not only reflects the magnificence of ancient civilization, but also assures visitors that they are about to explore the largest, most impressive temple complex ever built by man: Karnak Complex located in Thebes (luxor). From its modest 11th Dynasty beginnings, Pharaoh after Pharaoh added to and changed the temple’s existing buildings as an attempt to make their mark on Egypt’s most significant temple. The latter explains why visitors will be amazed by the temple’s matchless combination of many ancient generations, sensing a special historic scent and taste worth experiencing. The temple remained buried under sand for more than 1,000 years until excavation work began in the mid-19th century, and continues until our present day to reveal many ancient mysteries and secrets. Walking along an unsurpassed assembly of towering obelisks, endless courts and splendid chapels not only reflects the magnificence of ancient civilization, but also assures visitors that they are about to explore explore the largest, most impressive temple complex ever built by man: Karnak Complex located in Thebes. From its modest 11th Dynasty beginnings, Pharaoh after Pharaoh added to and changed the temple’s existing buildings as an attempt to make their mark on Egypt’s most significant temple. The latter explains why visitors will be amazed by the temple’s matchless combination of many ancient generations, sensing a special historic scent and taste worth experiencing. The temple remained buried under sand for more than 1,000 years until excavation work began in the mid-19th century, and continues until our present day to reveal many ancient mysteries and secrets. 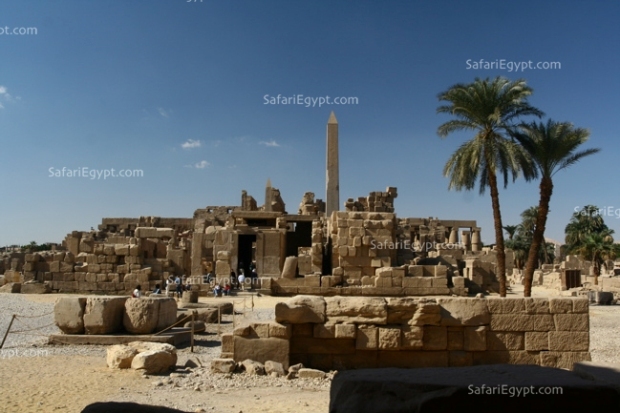 The Temple of Karnak is actually a combination of three main temples; that of Mut, Monto and Amun. In addition to smaller enclosed temples, and several outer temples, stretching on 247 acres of land, and located about three kilometers north of modern Luxor. Amun was the King of Gods; a powerful local in the Theban deity, whose power reached its climax after the short persecution led by Akhenaten. This fact explains why two thirds of the property owned by the temples belonged to Amun. During ancient times, the temple was known as Ipet-isut, meaning "The Most Sacred of Places" due to the numerous buildings dedicated to the God Amun.